School officials determined senior team members provided alcohol to underage members, coerced members to drink and forced exercise on those who refused, and conducted a scavenger hunt that included sexually explicit items. The university is investigating individuals involved in the hazing to determine if their individual behavior violated the student code of conduct. There are 16 senior members, 46 freshman recruits and about four transfer student on the team. During the suspension, the team will host and participate in the Cal Poly Share SLO Invitational track meet scheduled for March 22 through March 23 because of contractual requirements. A 7 meet suspension won’t do anything to prevent this but kicking those involved off the team would. Then again that might make mom and dad made and stop the cash flow and President Armstrong might not get his next raise and never make it to a million dollar salary. Why punish the guilty when you can punish the whole team… Punishing the innocent is a much better lesson. Developed bodies. Under developed intelligence. And where were the coaches? I’d be willing to bet this isn’t the first time for the track team hazing and it is an annual hazing induction to the team. How about Cal Poly suspend the ones responsible and let the non-hazing team members compete? 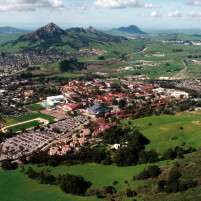 Students must still not understand that students are dying from hazing–even at Cal Poly. We’re doomed. How many “No DAMN HAZING” stories do these “Students” Need to hear?